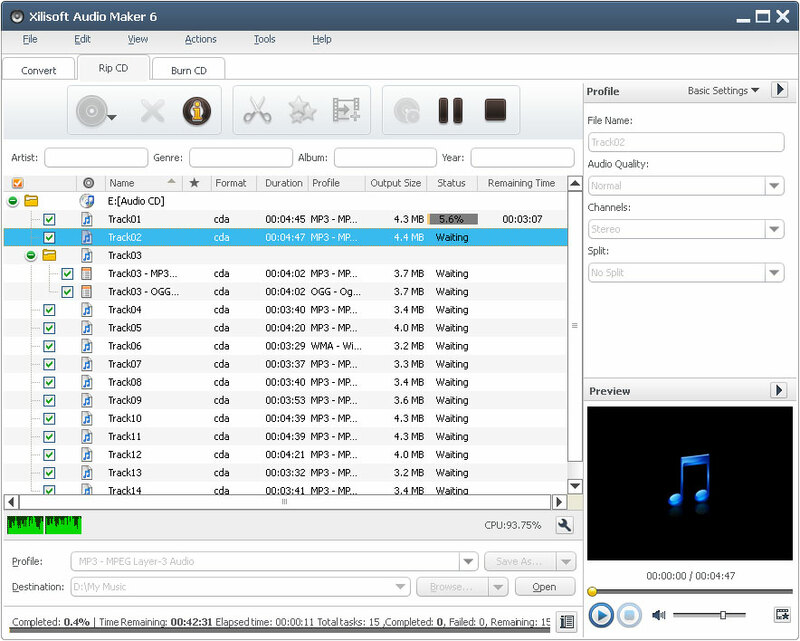 Xilisoft Audio Maker is a multifunctional audio tool, which includes the function of Audio Converter, CD Ripper, and CD Burner. With it, you can easily convert between all popular audio formats, such as convert MP3 to WAV, WAA to MP3 etc, and also you can rip CD to MP3, M4A, WAV, WMA, MP4, OGG, AAC etc, meanwhile, it can help you to convert and burn popular video and audio formats AVI, MPEG, WMV, MP4, 3GP, MP3, WMA, WAV, M4A, OGG etc to Audio CD. ...... ASF, MOV, MP4, 3GP, RM to your favorite audio formats. - As a CD Ripper, you can use Xilisoft Audio Maker to rip CD to popular audio files such as CD to MP3, M4A, WAV, WMA, MP2, OGG, AAC, AC3 etc. - As an Audio Burner, Xilisoft Audio Maker can help you to convert and burn your audio files to Audio CD. Xilisoft Audio Maker supports burning AVI, MPEG, WMV, MPEG4, 3GP, ASF, MOV, RM, MP2, MP3, WMA, WAV, AU, M4A, RA, OGG, AC3 etc to Audio CD. Discount Pack for dvd audio ripper, audio cd burner, audio converter, cd ripper. Burn and create normal audio CDs from your favorite MP3, WAV, WMA or OGG files. Audio MP3 Maker can grab CD to MP3, or convert between WAVE and MP3. easy to use powerful cda to mp3 converter and WAV to MP3 encoder for Windows. Qweas is providing links to Xilisoft Audio Maker 6.2.0.0331 as a courtesy, and makes no representations regarding Xilisoft Audio Maker or any other applications or any information related thereto. Any questions, complaints or claims regarding this application Xilisoft Audio Maker 6.2.0.0331 must be directed to the appropriate software vendor. You may click the publisher link of Xilisoft Audio Maker on the top of this page to get more details about the vendor.